Original installer may not work on modern systems; see Play the game on modern systems. 8.2 "You need to re-install Hexen 2 on this computer!" DRM: Game must be installed from CD, otherwise disc not required. Expansion pack requires disc in drive. Base game only. The Portal of Praevus expansion is unavailable for download. Hexen II: Continent of Blackmarsh is an extremely rare demo version of the game that was bundled with Matrox M3D series video cards. It includes the entire first chapter of the game. Hammer of Thyrion is a source port based on the source code release of the HeXen II engine. Many new improvements and features include OpenGL and Widescreen support. Hexen II was originally made for Windows 95, but it is difficult to get the game working on modern systems. 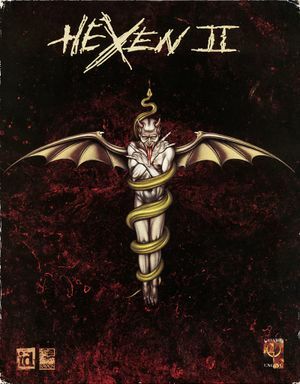 Download Hexen II: Hammer of Thyrion . Copy the content of the archive to a folder of choice. 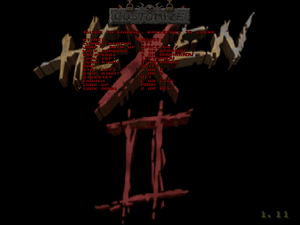 Copy the Hexen II game files pak0.pak and pak1.pak into the data1 folder. If you have the original CD, the game files are in CD:\INSTALL\HEXEN2\data1\. If you have an installed game, the game files are in <path-to-game>\data1\. Update the game files to version 1.11 if necessary by running h2patch.exe in the Hammer of Thyrion folder. Start the game by running glh2.exe. Install Hexen II and Hammer of Thyrion files as described above. Copy the pak3.pak file from the CD:\Install\Data\portals\ folder of the original installation CD, into the portals folder of your Hammer of Thyrion installation folder. Create a shortcut to the glh2.exe file. Add the -portals command line argument to the shortcut and start the game. To play Portal of Praevus, choose New game. To play the original Hexen II game, choose Old game. A source port is required. See Hammer of Thyrion. Not functional in GL version. See also Hammer of Thyrion. A source port is required. As the included opengl32.dll is a 3dfx-specific MiniGL wrapper, it should be deleted on systems not using 3dfx cards. This is one of the few games that have problems with long OpenGL extension strings. Regarding Nvidia, older drivers had the option to toggle extension string limit, but current drivers omit this option and instead have all problematic games hardcoded to limit the string. Therefore, the game should start up fine with up-to-date drivers. This can be verified and altered via Nvidia Inspector. XP SP3 compatibility mode fixes this issue. "You need to re-install Hexen 2 on this computer!" This is a type of copy-protection, activates if you reinstalled the OS or moved the game to a different computer. You can reinstall the game from the CD, install Hammer of Thyrion, or ensure that you also copy registry key HKEY_LOCAL_MACHINE\SYSTEM\CurrentControlSet\Control\ComputerName\ComputerName\RAID. ↑ 2.0 2.1 File/folder structure within this directory reflects the path(s) listed for Windows and/or Steam game data (use Wine regedit to access Windows registry paths). Games with Steam Cloud support may store data in ~/.steam/steam/userdata/<user-id>/9060/ in addition to or instead of this directory. The app ID (9060) may differ in some cases. Treat backslashes as forward slashes. See the glossary page for details. This page was last edited on 8 April 2019, at 04:53.